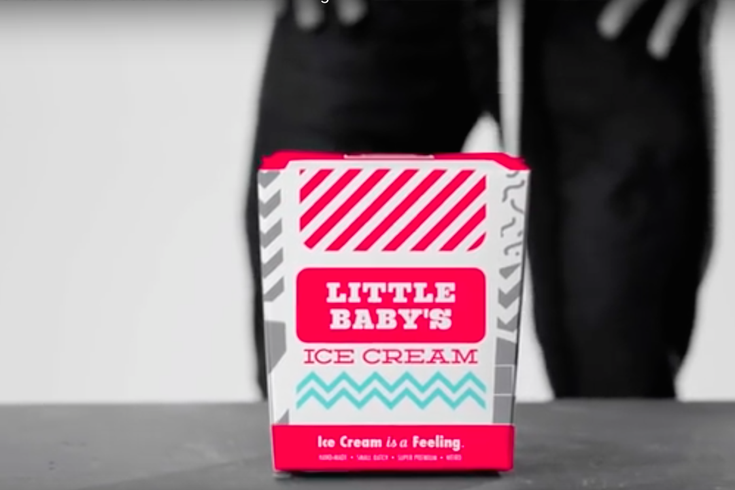 A box of ice cream from Little Baby's Ice Cream, located at 2311 Frankford Ave.
Friday, June 8 marks six years since Honeygrow opened its hectic Center City location at 110 S. 16th St., forever upping the midday demand for stir-fry in Philadelphia. In honor of the store's anniversary, Honeygrow is throwing an ice cream party of sorts, with help from East Kensington-based Little Baby's Ice Cream, which will dole out a free scoop to anyone who buys stir-fry, salad, or something from the honeybar between 1 and 3 p.m. at that location this Friday. The deal is better yet if you happen to ALSO have been born on June 8th. Show your ID at any Honeygrow location and your meal is free as you celebrate a new year. The deal coincides not only with the return of Honeygrow's stir-fry boxes (with help from local artist Amberella), but with an updated menu for summer as well. This week Honeygrow will relaunch its Lemon Miso Tahini stir-fry, which includes Philly-based Soom Tahini, available only at the 16th Street location. This summer Honeygrow is also rolling out an Old Bay-seasoned Chesapeake Crab stir-fry and a new summer salad with watermelon and baby spinach. The honeybar is getting an upgrade as well, with peaches, lemon whipped cream, and other seasonal flavors. See the full menu here.